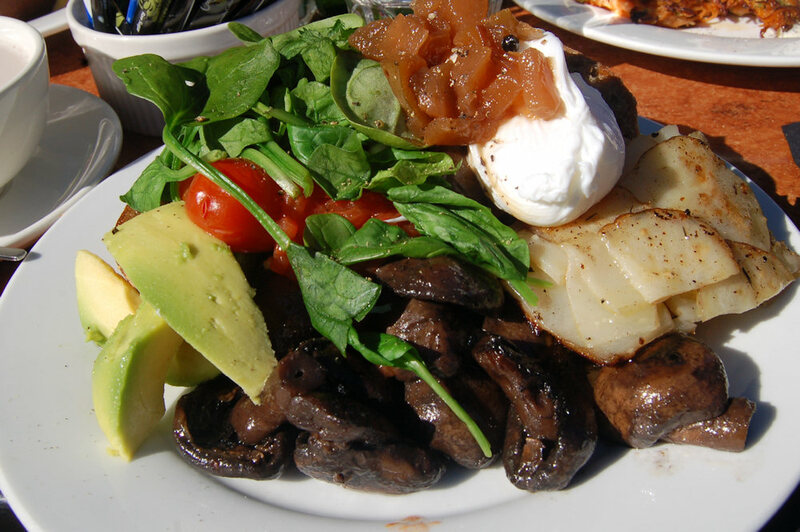 Hopes are high when you’re heading out for breakfast to a café named Big Brekky. 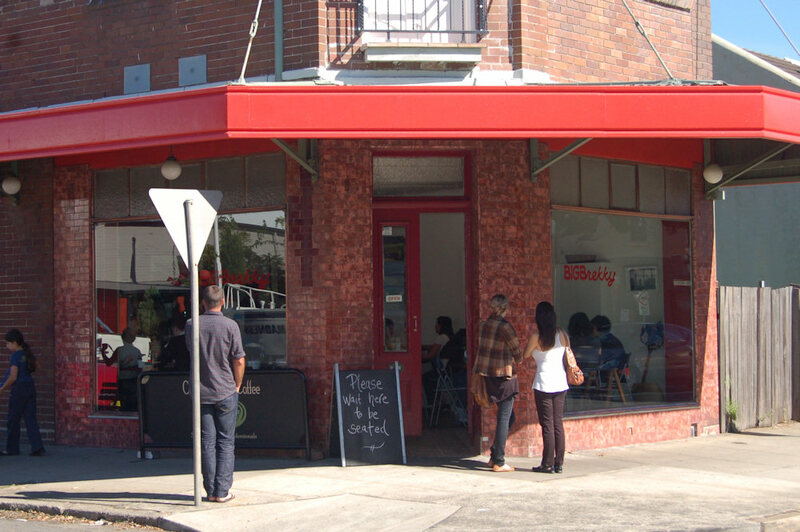 The café located on busy Stanmore Road, Petersham is larger than it looks. The main eating area is connected to a smaller room before spilling out into a garden at the back (the latter of which is a very casual affair – you almost feel as though you’re intruding on the neighbours). The staff were attentive from the beginning and let us know it would be a short wait for our table. It wasn’t long before we were seated outside in the garden area. 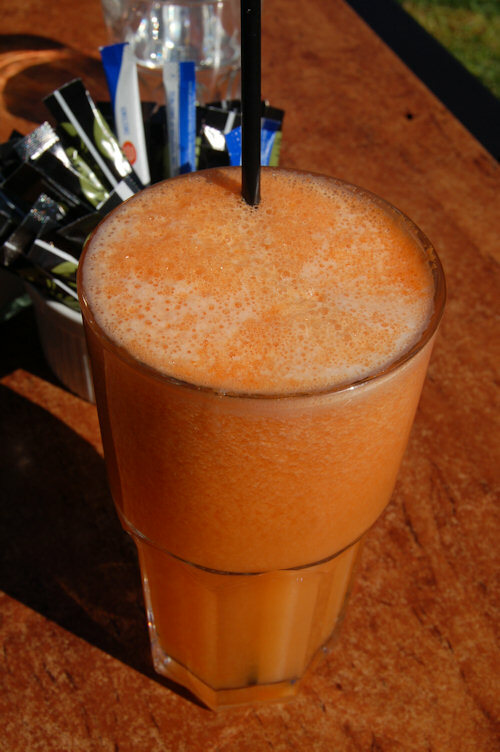 There are numerous freshly squeezed juices available: orange, pineapple, apple, watermelon, carrot, celery, beetroot, ginger and mint. We enjoyed a glass of half orange, half pineapple ($6) which came in a decently sized glass and was well blended. In this case, Big Brekky gets away with not adding ice because it was a crisp autumn morning. 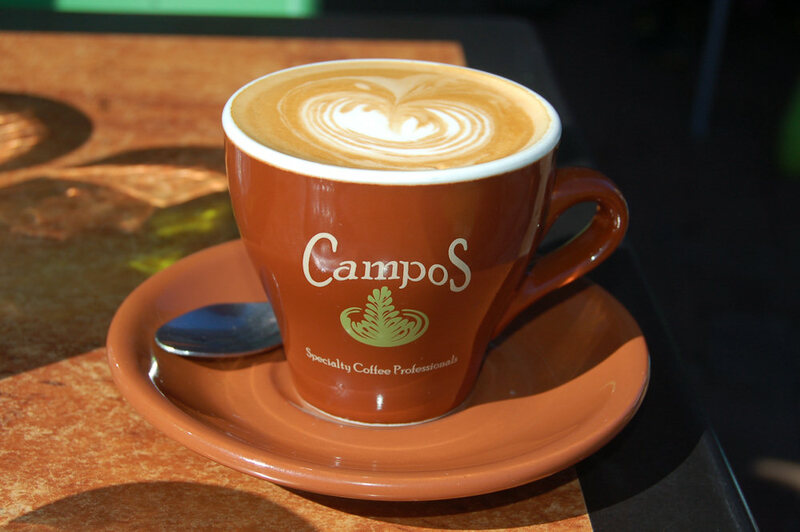 The flat white ($3.30) was made from Campos coffee so we expected the best. It was so good our guest ordered a second however it never arrived. Although it was a busy place we expected better service. When paying the bill they gave us our drinks for free to make up for this. Although we had a few issues with the drinks, the food made up for them. The Benedict ($13) was delightful. The thick brioche was not as menacing as it first looked. Soft and rich, it was almost one of the best flavours on the plate. 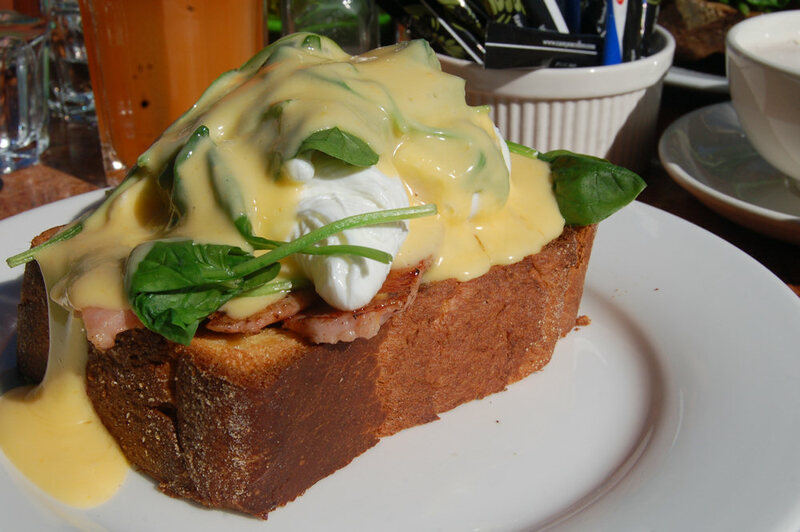 Almost… the thick ham, fresh spinach and hollandaise were fantastic and the eggs cooked perfectly. Highly recommended for any fans of eggs Benedict. 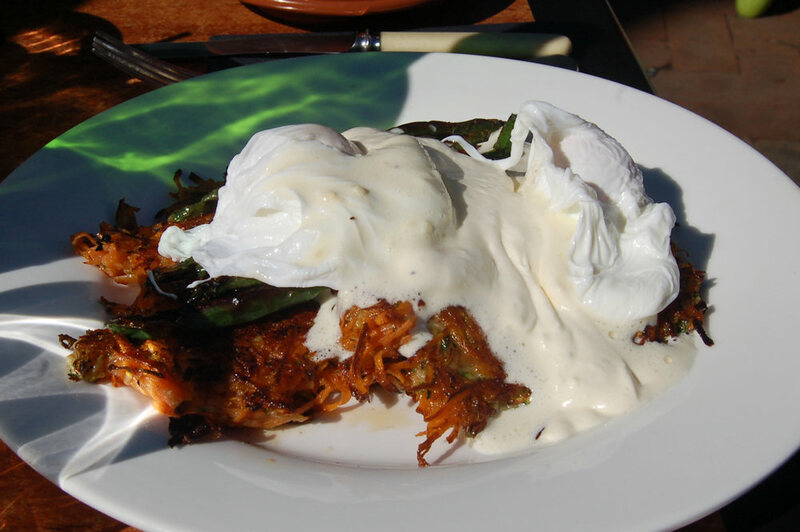 The Voluptuous Veg ($14) included two poached eggs on a base of green beans & sweet potato and zucchini fritters with horseradish cream. It was one of many choices for the vegetarians among us and did not disappoint on flavour. The unusual horseradish cream added a new spin to vegetable fritters that were light and well cooked. The café’s signature dish the Big Brekky ($18) was an overwhelming plate of food. It included eggs (how you like em), Eumundi Smokehouse bacon & fresh chorizo sausage, potato gratin, garlic mushrooms, roasted tomatoes and homemade pear chutney. Although April is a vegetarian, they had her at ‘pear chutney’ so she ordered the dish. The waitstaff offered to substitute spinach and avocado for the meat which all made a delicious dish. The bread was thick and crusty and the poached eggs were cooked to perfection. When cut open they drizzled over the bread and softened the bread slightly. The potato added nice variety to the dish, however the pear chutney seemed to get lost in the mountain of food. It all tasted great, however we will have to return to sample a simpler dish to thouroughly enjoy the pear chutney. 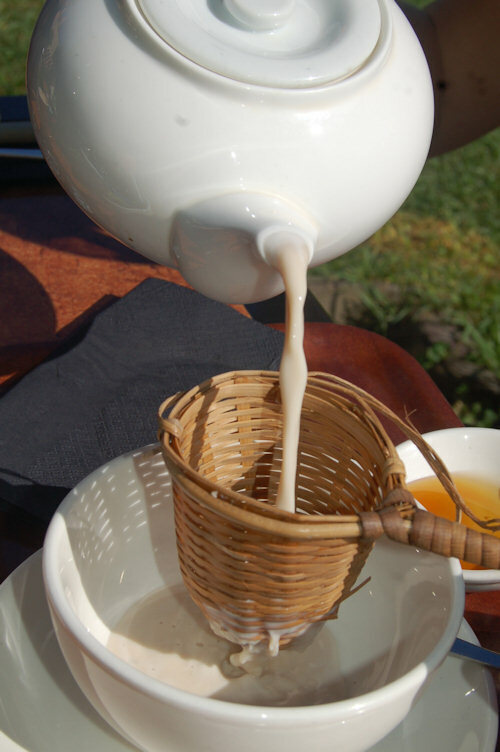 While sitting outside we encountered the occasional jumbo flying overhead however breakfast in the garden is highly recommended especially at this time of year (Autumn) when the mornings are crisp and the sun is nourishing and warm on your back. It is also very child friendly with a childrens’ table setting complete with toys. There is also plenty of room for prams and crawling babies on the grassy lot adjacent to the café. My friend Asako showed me this website and what a great one it is. I’ve told my friends about that love eating out for breakfast about it too. I always read the latest entries and recently went for breakie at this place and it was delicious. 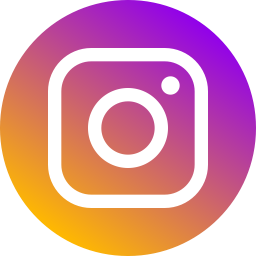 We’re glad to help Sydney’s café crowd find new establishments to enjoy. Thanks for reading!